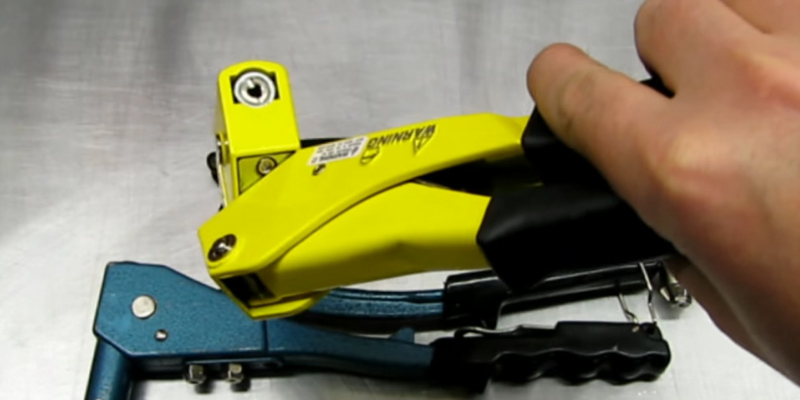 The tool can handle a variety of rivets up to ¼" in size. This allows fastening thick and heavy metal sheets. No wrench for nosepieces replacement. If you need a powerful rivet gun for large projects, this model is what you need. With this riveter, you'll be able to accomplish a variety of jobs in a short while. 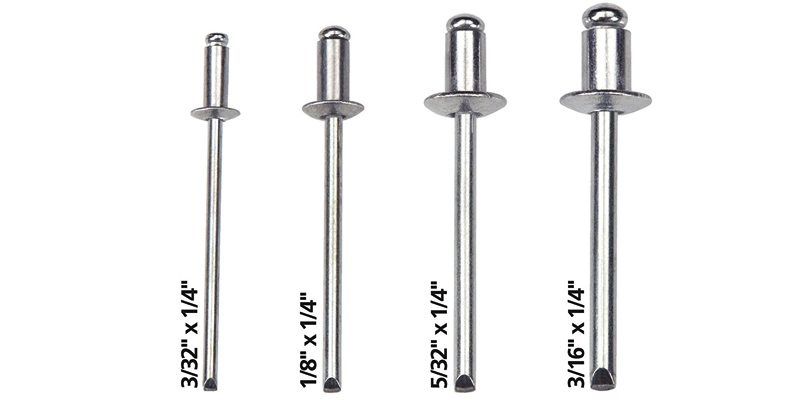 3/32", 1/8", 5/32", 3/16", 1/4"
The package includes all riveting accessories and 10 pieces of rivet nuts. The kit is supplied in a sturdy case. The gun is clumsy in tight places. For those needing to rivet fine sheets of metal, this hand riveter is surely one of the best models available. Also, the rivet nuts can be further used for other screws/nuts. 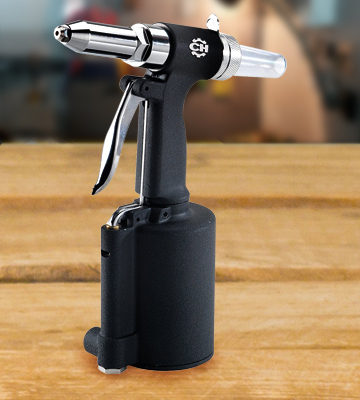 Made of sturdy stainless steel, this rivet gun will impress you with a long service life. Covered by a lifetime warranty from the manufacturer. The handle fastening ring is held by the rubber inserts, so it may come off over time. When it comes to riveting in hard-to-reach places, the MR77C hand rivet tool can be your best assistant. Small in size and with a turning head, it will let you make connection spots in the places where other models fail. The powder coating of the body provides excellent protection and a firm grip for your comfortable use. Given all the specs of the tool, it will come useful in many different jobs and projects, including not only construction sites but also car repair services. The Tekton rivet gun is a lightweight riveting tool which can be used for an extended period of time without hand fatigue. The storage compartment for accessories is located at your fingertips. 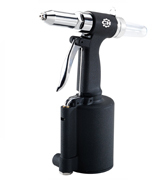 This cordless rivet gun will be of great use in any household. It will always be there when you need pop riveting. Being engaged in a large project, the operator should use only robust and powerful tools. The PR14 from Astro Pneumatic can become the right choice for this purpose. Since its operation is based upon an air compressor, it will deliver fast and efficient long-term performance. 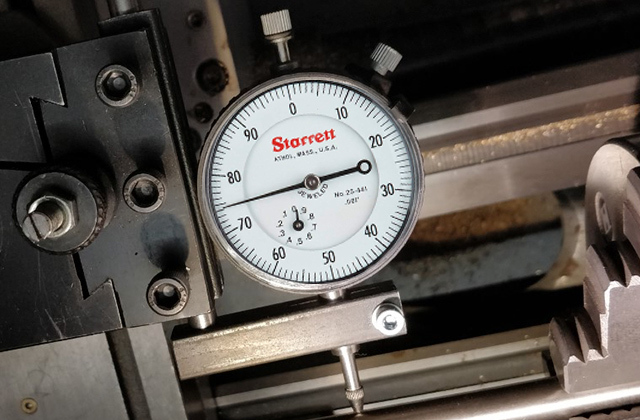 The pressure of 90-120 psi is considered to be optimal for this type of rivet guns and allows the user to switch to the highest pressure when it is needed to quickly drive steel rivets into the metal surfaces. However, it is advisable to reduce the pressure when working with the rivets made of aluminum. 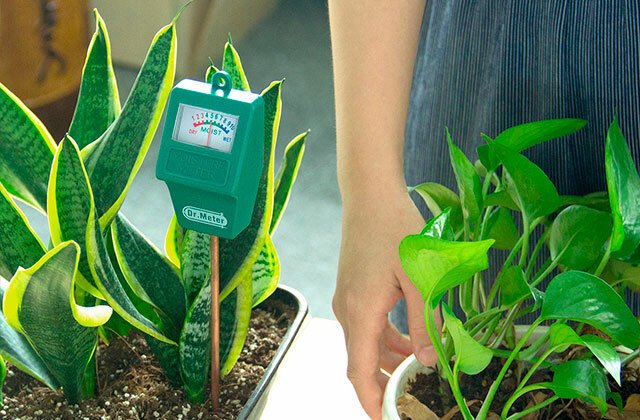 The optimal pressure for them varies from 90 to 100 psi. In general, you will be able to use the Astro Pneumatic for many backbreaking tasks and it will endure any loads. The ergonomic design and effective performance of the PR14 gun will let you work for extended periods of time without hand fatigue. We also like that this gun is fitted with a long nosepiece which allows it to rivet in tight places and at different angles. The assembly of the gun looks solid, which makes us believe it will serve you for long years ahead. The paint coating prevents the tool from corroding. Also, we'd like to take a note that after each shot the tool cuts the rivet mandrel off. This could be rather frustrating and messy if it was not for the special cylinder used here to collect the waste. 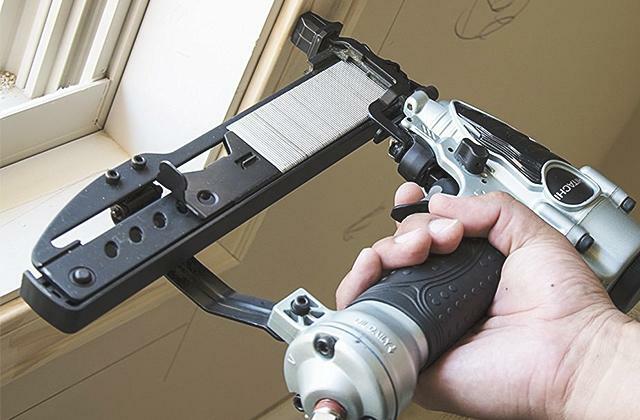 Finally, there's a hook on the tool that enables you to hang the gun on a wall when it is not in use. 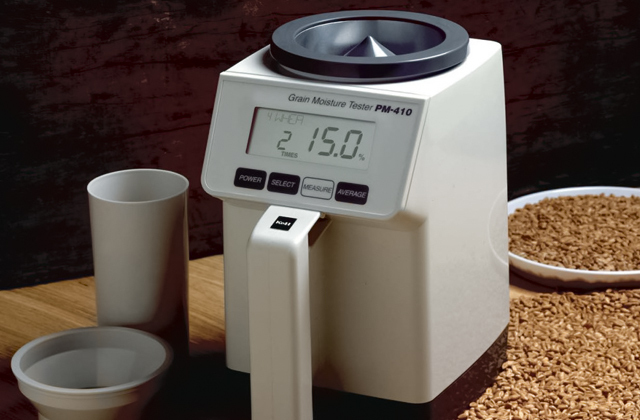 The PR14 is capable of handling the rivets of 5 sizes with the largest one making 1/4". The rivets of these sizes can be used to clamp many different materials, including pretty dense and hard pieces of metal. This property speaks for the versatile use of this gun, making it a perfect assistant just in any industry like automotive, aerospace, construction, furniture, computing, etc. 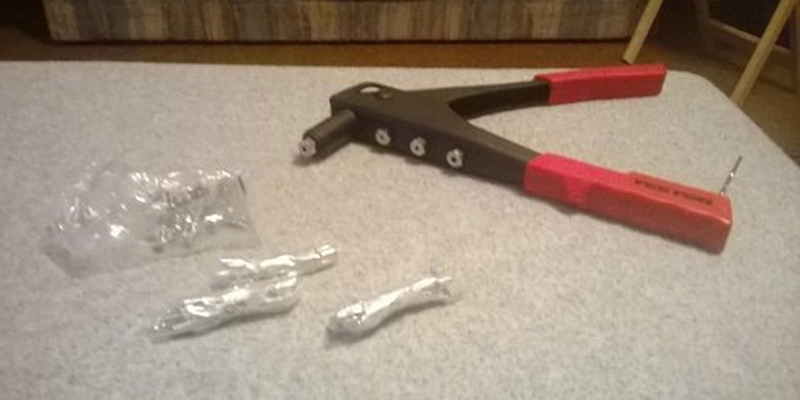 In the package, along with the gun, you will also find several nosepieces to use with different rivets. For your convenience of use, they can be stored in the base of the tool. 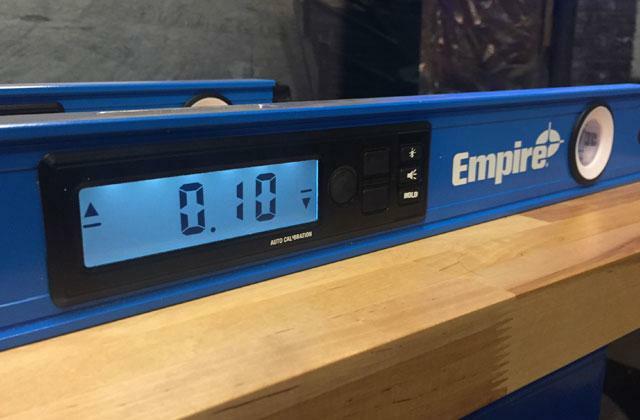 The common draw of all pneumatic riveting tools is their heavy weight. However, when it comes to the PR14, it isn't as heavy as most of them. Its weight is actually only 3.5 lbs. So, if you ever need to clamp something over your head, you'll do it easily. Astro Pneumatic Tool PR14: 1 lbs. Astro Pneumatic Tool Hand Riveter Kit (1442): 5 lbs. Campbell Hausfeld Pop Rivet Gun: 3.88 lbs. Tekton Rivet Gun (6555): 1.45 lbs. Nice solid gun with smart design features: Rubber flanged base so that it's stable when put down, convenient chuck holders under the base, to store needs other sizes. Worked extremely quickly. I have not tried metal or thicker rivets yet. Good sturdy base. 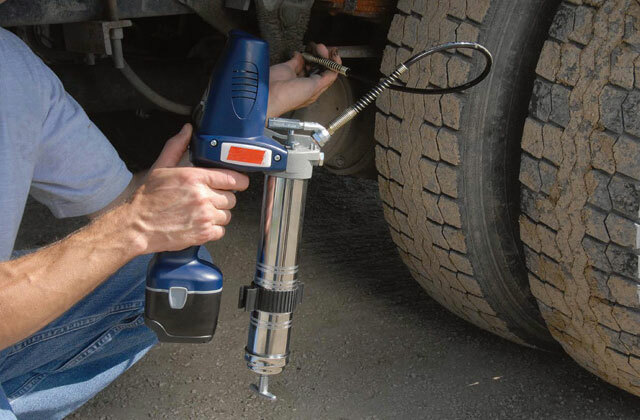 Compatible with rivet nuts, this rivet gun by Astro Tools may become a great purchase for all off-road drivers and people engaged in car turning, allowing them to use these nuts as the regular ones as well as quickly attach and demount different parts such as weather-clothes, spoilers, and other accessories and gear. 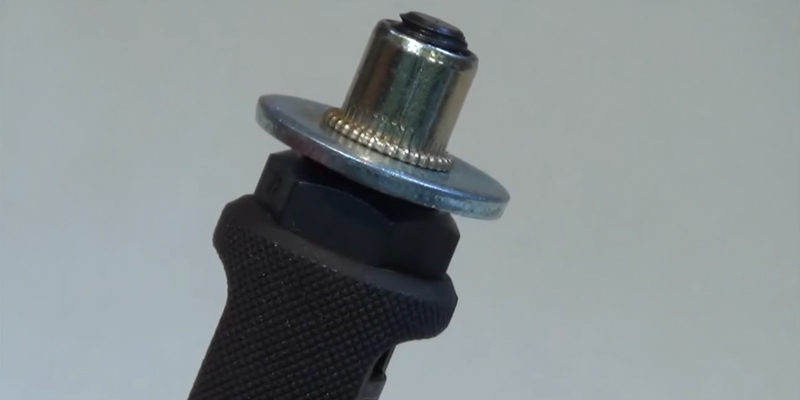 Rivet nuts can also be used for affixing parts to bicycles. What is more, these fasteners are easy to remove and replace when they wear out. The diameter of rivets is the parameter that determines durability of connection spots. The bigger the rivet is and the stronger the connection is, the greater the load it will bear. 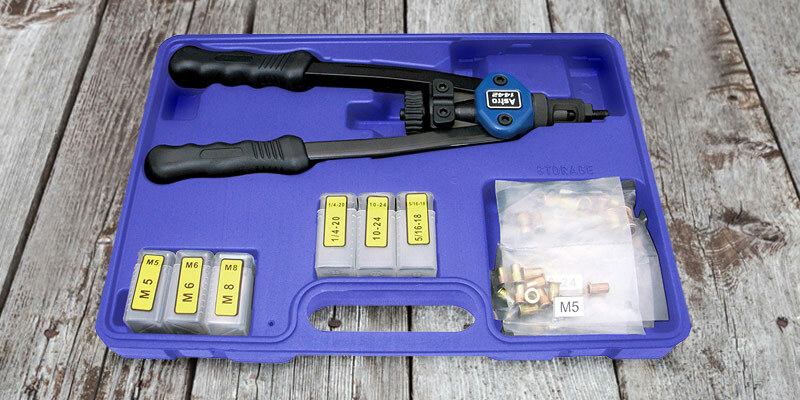 The Astro Pneumatic Tool 1442 handles M4, M5, M6, and M8 metric rivet nuts and 10-24, 1/4-20, and 5/16-18 SAE nuts. 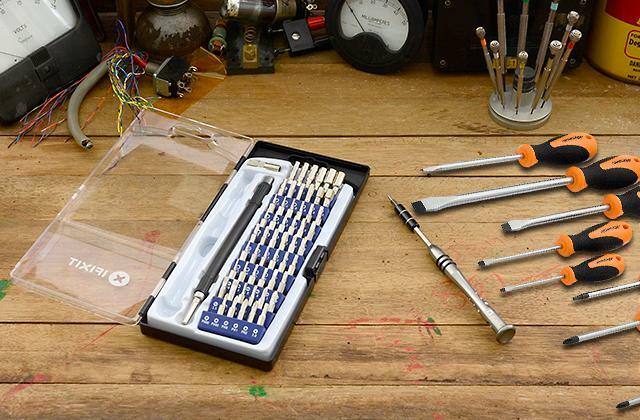 The kit includes 10 sets of rivets of different sizes except for the M4. Also, you'll find a set of replacement mandrels and nosepieces in the package. 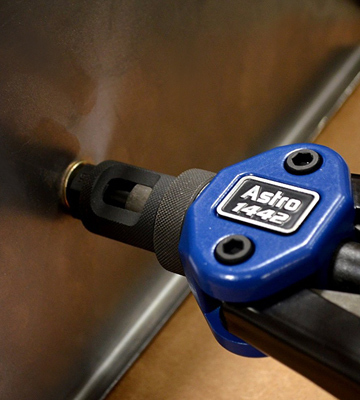 With the Astro Pneumatic hand riveter, driving large rivets is much easier than with any other model due to its increased leverage provided through the employment of dual hinges. We'd like to add a few words about usability features of this riveting tool. The innovative design of the mandrels and nosepieces allows their quick tool-free replacement. The body of the tool is ergonomic and of quality build. The handles are rubber-coated and ribbed, so holding it for an extended time will not tire your hands. What's more, the riveter is fitted with a spring-loaded hex sleeve that automatically prevents the mandrel from rotating during tightening. It is only the weight of the tool that you may take as a drawback. 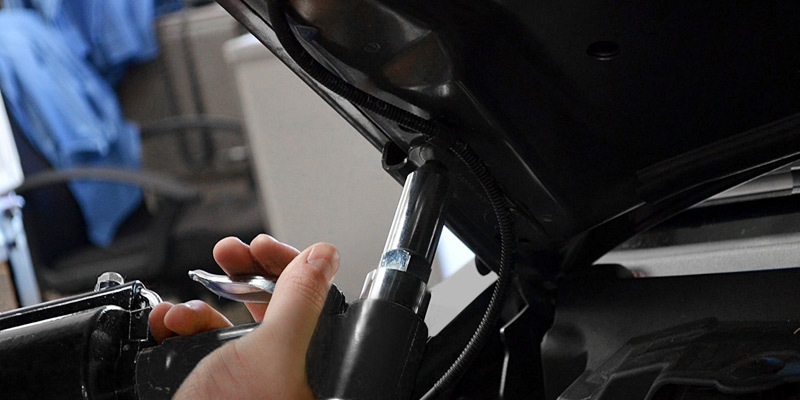 Rather than that, if you seek a high-performance and efficient riveter, the Astro Pneumatic can be the one to go for. 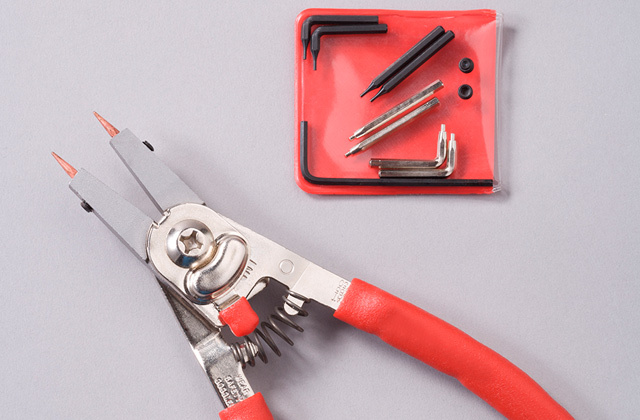 The riveter is supplied with a handy plastic case that you can further use for storage and transportation of the tool. This addition can make a big difference for those users who often work at different sites. This has done what I bought it for. I've used it quite a bit and it seems to be sturdy. Nice kit for the occasional user. Has an assortment of bits for the various sizes and includes some nutserts, too. Kit conveniently comes with 6 of the most commonly used / supplied sizes by manufactures. 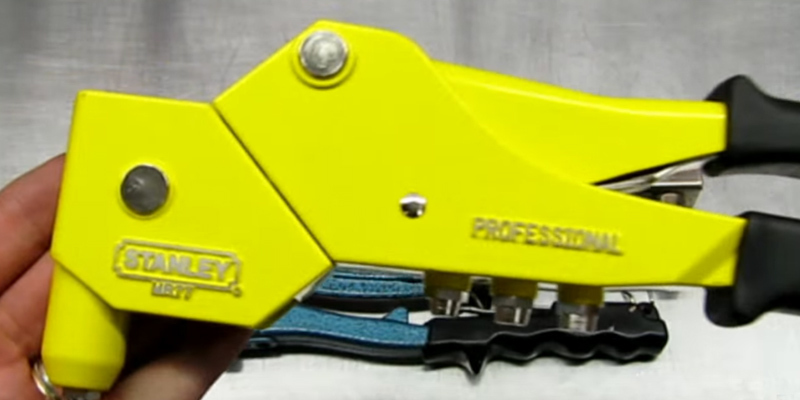 Let us present the hand rivet gun from one of the leading manufacturers of power tools, the Stanley MR77C. At first sight, you wouldn't tell it from any ordinary riveter, yet it's got some features that distinguish it from many other tools. One of the most obvious ones is the turning head that manufacturer has fitted this tool with. The ability to turn round and the overall compact size of the Stanley MR77C allow its use in confined places where other tools fail to get to. Perhaps, this is the only model on sale that can boast such great maneuverability. The tool drives 1/8, 3/32, 5/32, and 3/16" pop rivets. The rivets of this kind are widely used in such industries as mechanical engineering, energetics, electronics, and household machinery. 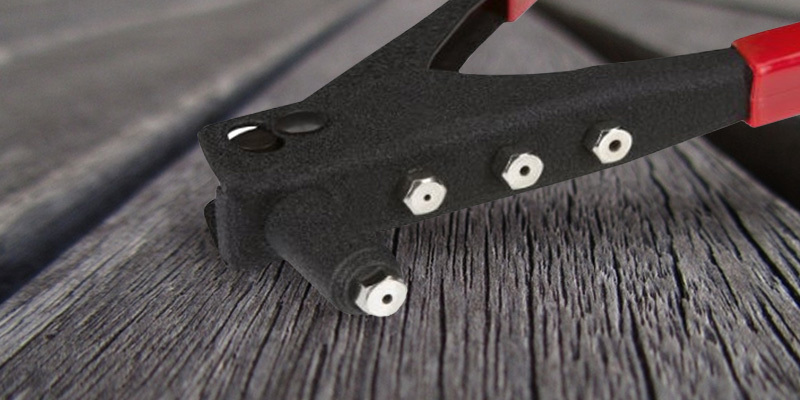 The advantages of pop rivets are the possibility to drive them, having access to the connection spot from one side only, and that they can also serve as anchors. Besides, the compatible 3/16" rivets will be more than enough to fasten different-sized materials and make a robust connection. Besides a turning head, there are some other features that are surely worth your attention. 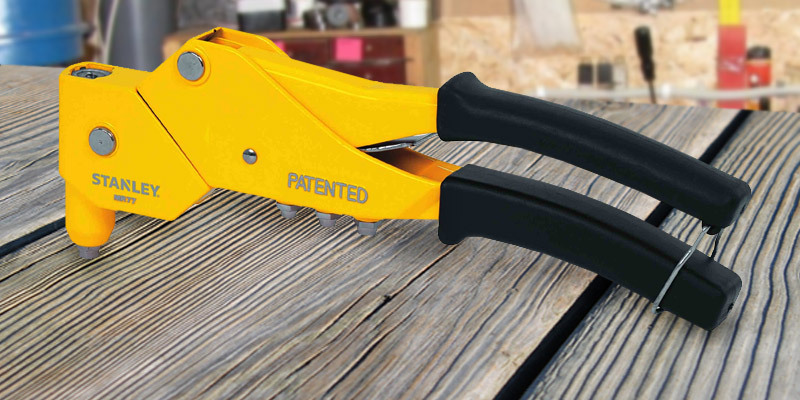 To ensure a long service life of the tool, Stanley has enclosed this riveter in a solid die-cast body, while in order to make it convenient for the user to operate it for a long time, coated the grip with rubber. When the tool is not in use, a special loop on the tool allows you to clamp it together and store away. 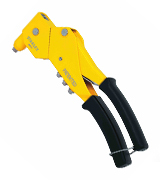 The attachments can also be stored compactly and safely right in the handle of the tool. As we've mentioned above, this tool has a solid assembly. It's also covered by a lifetime warranty from the manufacturer, which speaks of the high quality and long useful life of all Stanley products. Astro Pneumatic Tool PR14: 8 in. 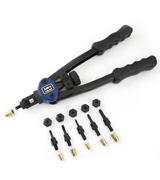 Astro Pneumatic Tool Hand Riveter Kit (1442): 7 in. Campbell Hausfeld Pop Rivet Gun: 6.7 in. Tekton Rivet Gun (6555): 6.8 in. This riveter works well. It swivels so that you can use it at a right angle (like a traditional rivet gun) or straight on if the clearance requires you to rotate it. It can work with 4 different sizes of rivets, by means of (screw-in) replaceable nose pieces. 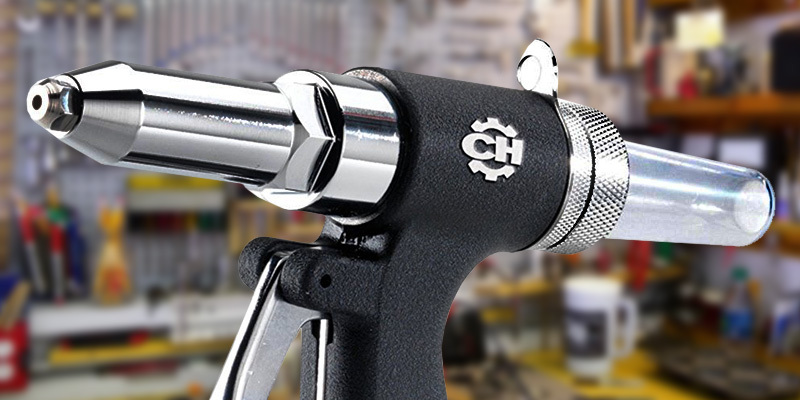 The rivet gun from Campbell Hausfeld will suit a variety of fastening jobs no matter what kind of materials you work with. The operation of the CL153900AV is based upon an air compressor and its hammering power makes 2,000 lbs. It isn't the highest power yield you could get of course, but if you mostly work with average-sized metal sheets, it will definitely suffice. Like all pneumatic tools, the Campbell Hausfeld is powered by the compressed air which drives the hydraulic piston on coming out of the gun's cylinder. Then, the piston enables the riveter's pulling and cutting mechanism. Keep in mind, all pneumatic guns need regular maintenance. So, make sure to look after the moving parts of your riveter and grease it timely. 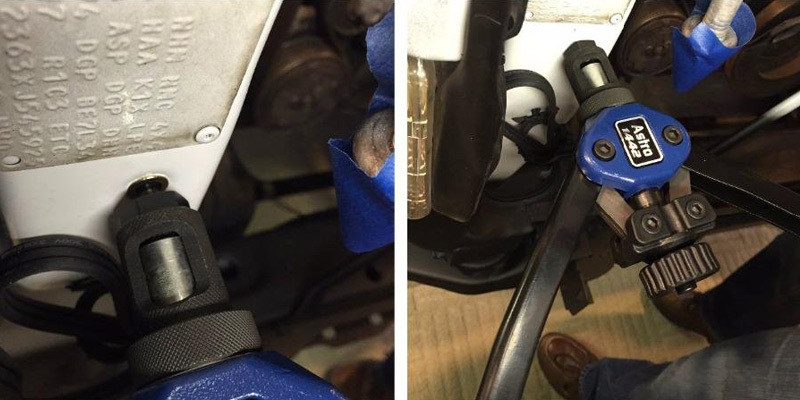 It's also advisable to use a quick-change adapter for connecting the air compressor to the tool. A thought-out design of the CL153900AV is ought to be remarked. Casting a quick look at this riveter, you will not have any doubts of its long service life. The body of the tool is produced from hardened steel while its base is covered with a powder coating. According to users, the performance of the gun doesn't get worse even after a thousand rivets. We'd also like to take a note of the mandrel collector that cuts and collects the tails of the rivets once they are forced into the metal. The tool is also very convenient to store thanks to the hook on the body, so you can hang it on a wall when the tool is not in use. The only thing that may cause some inconvenience during work is the weight of the gun. Finally, we'd like to say a few words about the ergonomics and some usability features of this riveter. 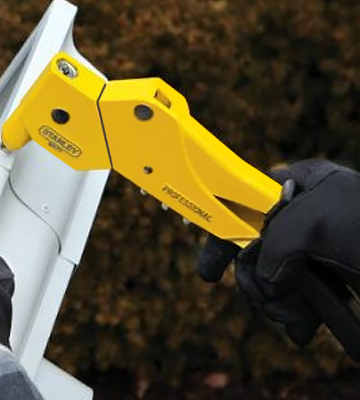 In order to prolong the service life of the tool, the manufacturer has reinforced the tool by covering its body with a powder coating which not only protects the gun but also makes the surface more ribbed for a firmer grip. 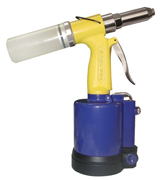 The long nosepiece used in the gun allows the user to operate the tool in confined places. Astro Pneumatic Tool PR14: 16 in. Astro Pneumatic Tool Hand Riveter Kit (1442): 18 in. Campbell Hausfeld Pop Rivet Gun: 11 in. Tekton Rivet Gun (6555): 13.2 in. Nice and sturdy unit. Finish is a powder coat of some type. The gripping and pulling action of the jaws was impressive and drew the rivets down very tightly. This works so much easier than any hand held rivet gun! Works with ease and also works great! 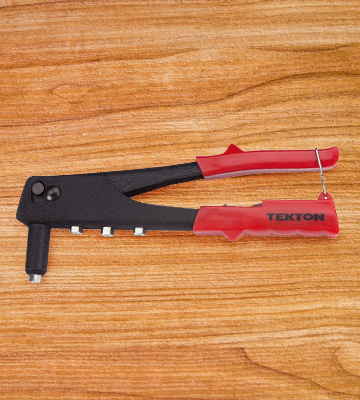 The Tekton 6555 is a type of hand rivet guns that can be successfully employed for many occasional household jobs. So, if your projects don't require usage of professional tools, this riveting tool may become a great solution for a good price. The Tekton 6555 has proved to be efficient for fastening metal pieces and other quite dense materials of small- and mid thickness. 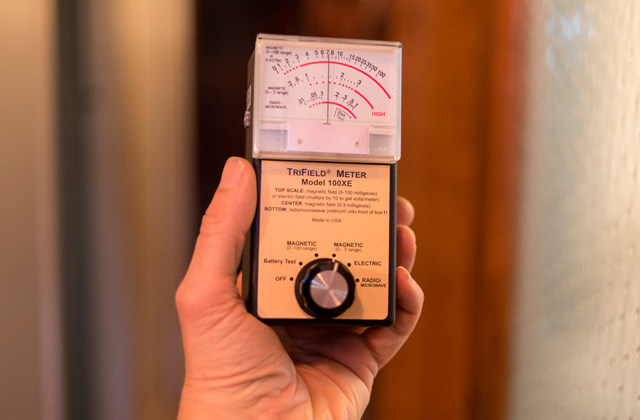 So, without any doubt, the Tekton 6555 will be of great use in any household. Let's cover the usability features the Tekton 6555 offers. First of all, let's say that this is a quality tool that will last you a lifetime provided that you look after it and maintain it properly. It's made of sturdy steel and fitted with the heavy-duty plastic handles. On the handle, you'll find a special ring to clinch the tool for its compact storage and transportation. All nose attachments can be accommodated right in the base of the gun so you can access them any time. So, what are the advantages of pop rivets? First of all, let's mention that the Tekton 6555 is compatible with pop rivets only. These are the basic fastening accessories used for making non-detachable connection spots. The advantage of working with the pop rivets is that you don't need to have any special skills or experience to drive them. Besides, in order to make a connection spot, it will be enough to have access to the spot only from one side. The pop rivets are used for fastening a variety of materials, including metal, wood, and plastic. 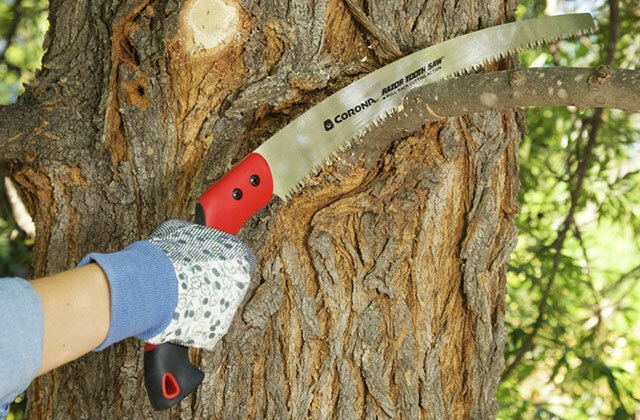 The Tekton 6555 is very easy-to-use. 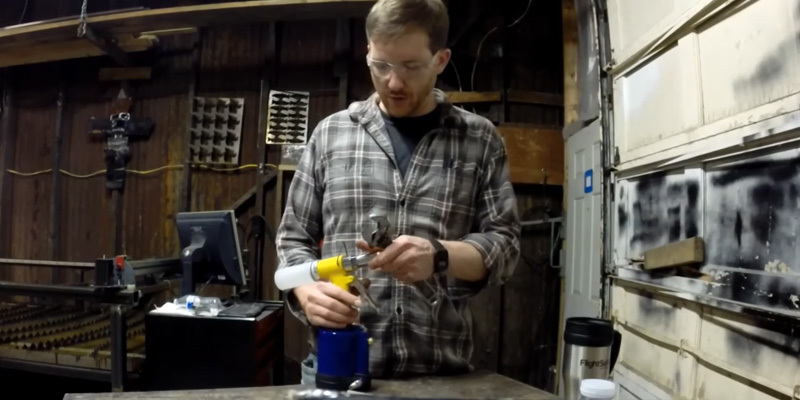 All you need is to drill a hole for a rivet (a bit larger than the rivet itself), then insert the fastener into the nose of the gun, put the rivet in place, and squeeze the handles together to snap it. 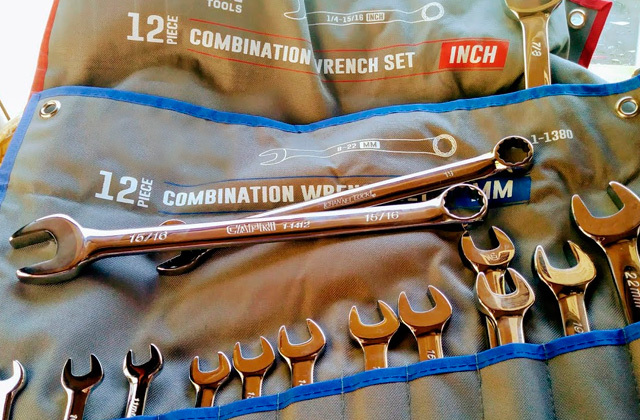 The package includes rivet heads, a wrench, and 40 rivets of 4 different sizes. So, it's actually totally ready-to-use out-of-the-box. Astro Pneumatic Tool PR14: 4 in. Astro Pneumatic Tool Hand Riveter Kit (1442): 2 in. Campbell Hausfeld Pop Rivet Gun: 3.3 in. 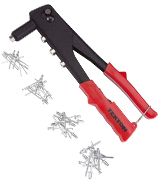 Tekton Rivet Gun (6555): 1.2 in. The fact that it came with several rivets in various sizes was nice but my kit came with the rivets I needed. It has a small wrench that would be handy for removing the adapter for the different size rivets. On construction sites, it is often the case that some of the parts need to be pinned or fastened together. For fastening pieces of wood, you could use a staple gun, while if you needed to pin some metal parts, you'd need to use a rivet gun. 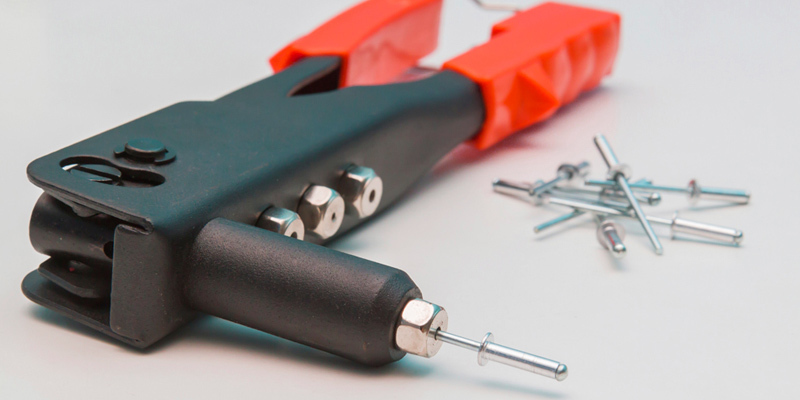 So, what is a rivet gun and what are the advantages of using this tool? A rivet gun is a tool which is used for driving rivets into the metal surfaces. 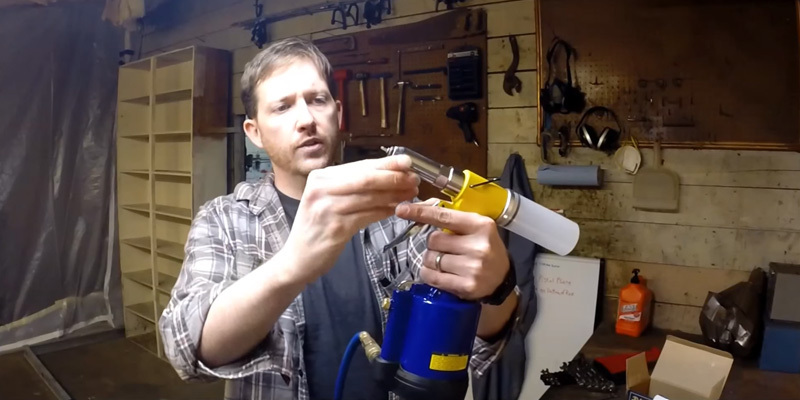 It comes helpful in many different situations where the use of a MIG welder is impossible. Riveting is often used for clamping metalware and other materials like rubber, plastic, cardboard, and some other combinations. Another obvious advantage of the rivet guns is that they operate quickly, are very easy-to-use, and ensure secure fastening. 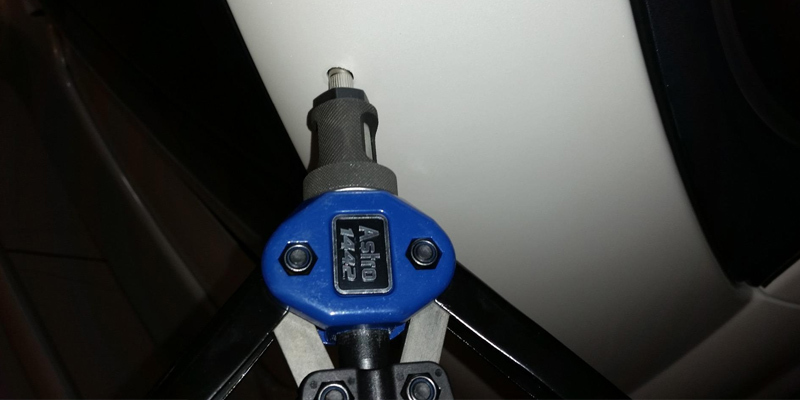 In order to make a connection spot, you will need to drill some holes through the parts, then attach a rivet to the gun nosepiece, insert the rivet into the hole and push the trigger. Continue reading our five best rivet guns reviews and select the most appropriate tool for your projects. To pick the right riveting tool for your specific project, you should get acquainted with its tech characteristics. Riveting guns are commonly classified according to their operating principle and fall into the following three groups: battery-powered, manual, and pneumatic. The advantage of pneumatic and battery-operated guns is that they are usually very powerful and operate considerably faster than the manual tools. With a battery-powered gun, the operator isn't going to be bound to the socket but eventually, will need to break away from work to charge it. In this sense, pneumatic guns can offer you nonstop performance and therefore, suit large projects better. 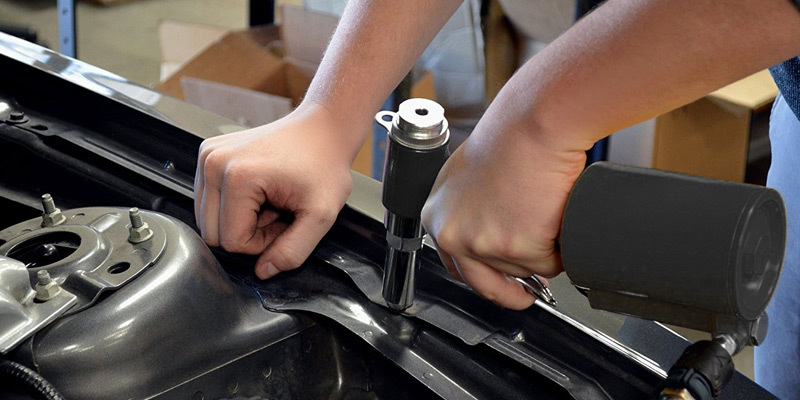 Manual rivet guns won't let you work as fast as you could have done using either of the two mentioned above, however, they can offer you complete independence from batteries and air compressors, as well as greater mobility due to their small size and light weight. When selecting a riveter, you should also consider its compatibility with the rivets you will need for your projects. Depending on the material that you work with, you may select the rivets of different sizes. Thus, large rivets ensure a stronger connection and therefore, should be used for fastening dense and hard materials. Smaller rivets work better with pliable materials. Finally, it is important to consider the extra features. In order to estimate overall durability of the tool, check out the design of the gun and what material it's been produced from. Also, take a look at the convenience features such as handles, the weight of the tool, etc. Riveting isn't always a quick process and if you don't want to fatigue your hand, it's better to opt for the ergonomic tool. Q: What is the procedure for riveting? A: Prepare the pieces you need to connect together. 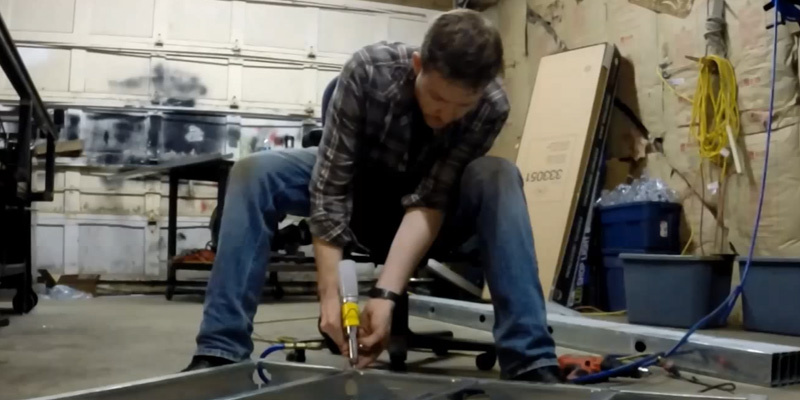 Take an electric drill and a sharp metal bit that drills the holes of 1/8" in size. Most rivets in your home will be about the same size so it's very unlikely you will need to make larger holes. Overlap the pieces and drill a 1/8" hole through both of them. Use a vise to hold the pieces together and don't move them while you drill a hole. Insert a rivet into the gun. Push the smaller end of the rivet through the hole and press the tool hard against the pieces so that the larger head of the rivet is pressed tightly against the metal. Squeeze the handles of the riveter. The tool thus will pull the mandrel within the rivet. The moment the head of the mandrel reaches the small end of the rivet, two pieces will be pressed together. You might need to squeeze the handles two, three or four times to draw the mandrel through the rivet. Once you're done, you'll get a tight connection. In case you need to drill through two finished pieces of metal, do it very carefully, otherwise the drill may grab them and spin. If you're not wearing gloves, the spinning metal can cut your hands, fingers or arms. A: When you work with a riveting tool, protect yourself from possible injuries. Wear safety goggles to protect your eyes from flying particles or debris. It is also advisable to wear gloves and a safety jacket. To avoid accidents, people who work nearby must also wear protective outfit. 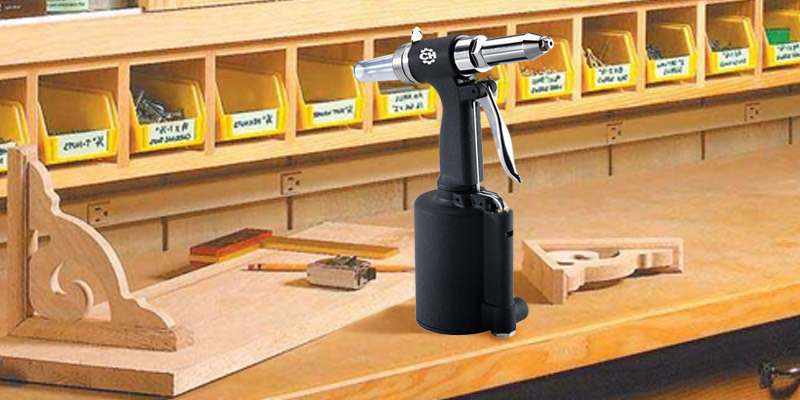 A: To keep your pop rivet gun in a good working condition, it's important to look after it. 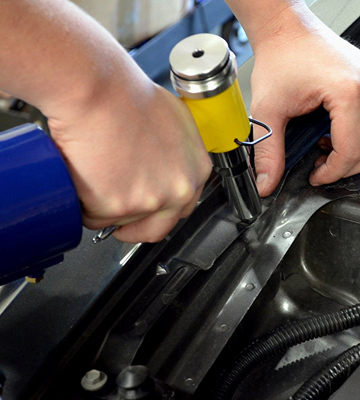 Seek a qualified person to inspect and service the tool on a regular basis. This will ensure a proper gun operation. 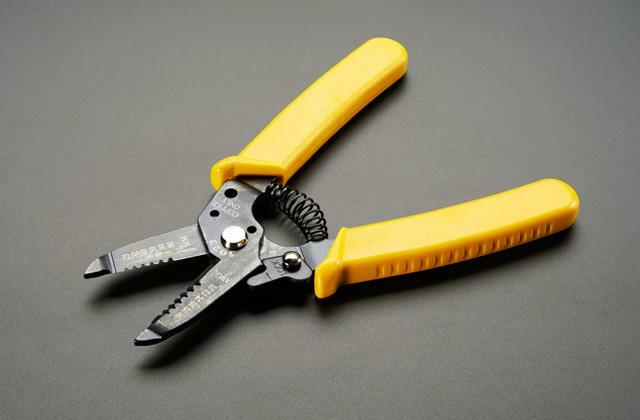 The regular maintenance will help you keep your tool in a proper condition and prevent expensive repairs. A: Choose a drill bit that is slightly bigger than the rivet mandrel but smaller than its head. Put the drill bit into the drill, making sure that your metal work doesn't move, so that you can safely and easily drill the rivet. Make an indent in the rivet to guide the bit unless it has no factory indent. Place the tip of the bit in the center of the rivet head and start drilling. Once the head comes off the rivet, stop drilling instantly. If you carry on drilling, you may spoil your work. If the rivet hasn't come off due to vibrations, simply remove the rest of the rivet with the center punch and hammer. Put the punch onto the rivet mandrel and hit it; this should expel the rest of the rivet. 1. Rivet Gun Operation, ThomasNet. 2. Skill Builder: Know Your Rivets, Maker Media. 3. 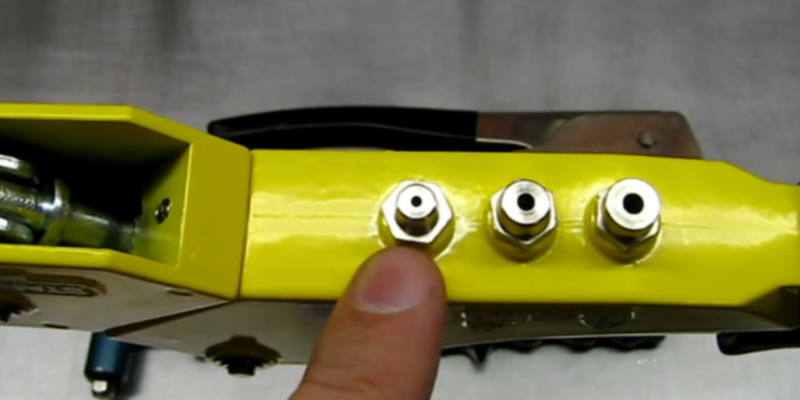 How to Rivet Gutters: 4 Tips, DoItYourself. 4. Linda Cottin Fix-It Chick: Use pop rivets for fastening materials, LJWorld. January 3, 2016. 5. Rivet gun, Wikipedia. November 3, 2016. 6. 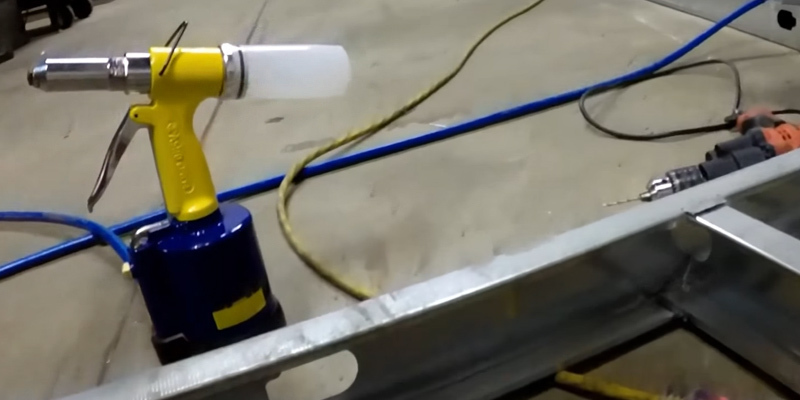 How a Rivet Gun Works, DoItYourself.